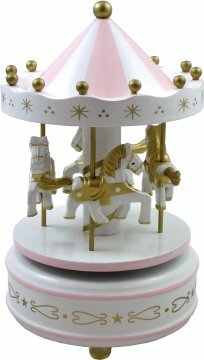 BBCAR297 Musical Carousel "Daydream" White & Pastel Pink Magical Carousel.Music "A dream is a wish your heart makes". An enchanting musical carousel with four miniature merry go round horses. Hand painted in white with pastel pink & gold highlights as the traditional music box plays the horses go round the carousel. A beautiful keepsake music box. Approx Size : 18 x 10.6cm (7 1/8" x 4 1/8") Order Code : BBCAR297 Price : £22.99 *Please note this is an ornamental item that contains small removeable parts. *It is not a toy and not suitable for children to use unattended.